Last year, Dublin / Clare rockers The Walls promised a new EP in early 2011 with an album to follow later in the year. So far they’ve delivering on queue! After spending most of 2010 perfecting and touring their two man live show, this is the first solid release of new material since 2005’s New Dawn Breaking and it has been worth the wait. Taking material from their forthcoming album, Stop The Lights and sticking in a couple of EP only bonuses, Bird In A Cage is an excellent introduction to the bands revived , laid back sound with that striking talent for song-writing Joe and Steve Wall have made their backs on. Opening with the EP’s title track, you’re introduced to a very personal, biographical glimpse into Steve’s childhood with an uplifting chorus that’s sure to bring you back for more. Chrome Heart brings back some early Wall’s styles with paced lead guitars, low tempo vocals and a chucky bass shoulder to lean on. Being the Walls, the song retracts and expands like nothing else but never loses it’s dead straight composure. All A Blur, also taken from the next album highlights the bands incredible talent for simple, catchy music with no frills needed to make their music any more appealing that it already is. The Big Freeze brings to a close on a down note. Not that it’s bad, but as instrumentals go there’s not much here. Any fan out there knows the Walls are capable of much better, something that is not only obvious from their previous records, but also from the new material they’ve been playing live over the past year. All that means is we get some crackin’ tunes now and an amazing album later in the year. Not too shabby for Tickets There! The EP can be downloaded now for €3 from The Wall’s Bandcamp page. 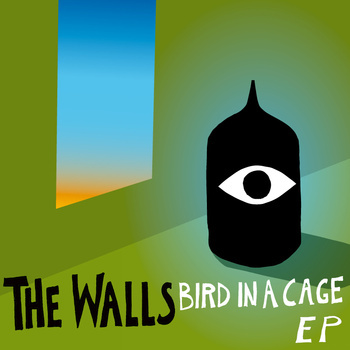 Title track Bird In A Cage is also available as a free download on the same page. This entry was posted on April 7, 2011 at 12:31 am and is filed under EP Review, IRISH NOISE!, Music with tags All A BLur, Bird In A Cage, Bird In A Cage EP, Chrome Heart, Joe Wall, New Dawn Breaking, Review, Steve Wall, Stop The Lights, The Walls. You can follow any responses to this entry through the RSS 2.0 feed. You can leave a response, or trackback from your own site.